A screenshot from UC Davis' online ticket diversion class, which is available to anyone. The California Bicycle Coalition held a webinar this morning on how to set up a bicycle ticket diversion program. When car drivers get tickets for breaking the law, they often have the choice to go to traffic school to reduce their fine. But until the passage of A.B 902, no such option existed for bike riders in California. The programs discussed at the webinar are all unique. UC Davis offers an online course. The city of Gilroy has a program for youth offenders, taught by police officers and supported by the local health department. Sacramento set up a pilot program run by the public works department. Each place also had unique challenges in creating a program that could work with their court systems. In Sacramento, for example, citations are handled differently by different sections of law enforcement. Some are electronic, and they are immediately sent into the court system. Some are still issued on paper, and the process is slower. Because the courts don’t want to take on any additional administrative tasks, planners have been trying to figure out how to flag citations that are eligible for diversion before they enter the court system. Donlon Wyant, consulting with the League of American Cyclists, Bike East Bay, and Davis, created a class called “Urban Cycling 101″ that covers rules of the road as well as safe riding techniques. The class is free to anyone who wants to take it, and in the short time it’s existed, it has already had lots of participation–and that’s without anyone having been ticketed under the new ordinance yet. The city of Gilroy has a successful program for youth offenders that splits responsibilities between the police department and the public health department. The police flag which citations are eligible for the program and teach the classes, which were created with input from the League of American Bicyclists. The challenges for Gilroy include rotating job duties, which make it difficult to keep officers who have been trained to lead the class available to teach it, and finding state funding to help support the program’s administration. The classes in Gilroy average about 25 people, including the required attendance of at least one parent or guardian per ticketed youth. Participants pay $10, which goes towards class materials, and when they complete the class they get the citations dismissed. The city also gives out free bike helmets to participants. Officer Felix Figueroa said that Gilroy has found the program to be helpful in reducing crashes and improving overall safety. UC Davis created a different model for its Bicycle Education and Enforcement Program (BEEP) (best acronym ever). BEEP offers an online course that participants have fourteen days to complete, including passing a test, to get their fine waived. People who have been ticketed pay $70 for the program, but it’s available for free to anyone who is interested in taking it. Over 1600 people have completed the course for ticket diversion purposes, but more than 2300 have completed it for educational purposes. The class fees support the program, and also fund an on-campus program to provide bike lights to students who need them. Bike East Bay was instrumental in helping UC Berkeley set up its diversion program. There, campus police were issuing tickets to bicyclists who violated the campus “dismount zone,” but the fines were adding up to over $200. The school didn’t want to create a financial burden for students, but did want to be able to enforce its no-riding zones through crowded pedestrian areas. So the campus police worked with Bike East Bay to offer two-hour bike safety classes led by League of American Bicyclist-certified instructors. Many of the classes are open to anyone who wants to take them. Robert Prinz, Educational Director at Bike East Bay, outlined basic considerations for creating a diversion program. “If we’re seeing a lot of bicyclists breaking laws,” said Prinz, “That may not be as much a reflection on the individual as it is about the context they’re riding in. Where bike infrastructure is missing or weak, you’ll only see the more aggressive bike riders using it,” while having a wider range of riders, including seniors and youth, could change that dynamic. Ultimately, the classes are “not just about the rules of the road—they’re about getting people past that sense of discomfort or lack of confidence, and to empower them to make the right decisions. Because sometimes following the law feels less safe,” especially for inexperienced bike riders. Consideration about where to teach the classes is also important, said Prinz. They should be as accessible as possible—near transit hubs, for example. They should also be offered at locations that are known and trusted, such as libraries. He warned against holding classes at police departments, which can make some participants uncomfortable. People want to learn about bike safety, and there are few venues for doing so. If a diversion program can be the beginning of a wider educational program, so much the better. 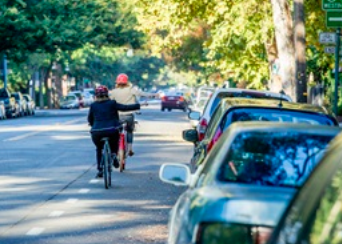 The students taking classes in Sacramento, the East Bay, and in Davis, for example, have surely benefited from their new knowledge, as have their communities, by having more bike riders who know the safe and correct way to ride on their streets. A California bill passed in 2015 allows bicyclists who get tickets to attend "bike traffic school" and reduce their fines, but currently there are few places where that is possible. The California Bicycle Coalition will present a webinar on how to get a diversion program started. Is LA Really Considering a Mandatory Bike Licensing Program? Last month, the Los Angeles City Council unanimously passed a motion to encourage people to record bicycle serial numbers.